Over time it’s seeming like the purpose of this blog is to shatter the illusion that I’m cool. We’ve learned about my penchant for pop-esque punk music, my too high level of excitement over things like fried pizza, and that I consider meeting someone for coffee an event worth documenting. Nine times out of ten when you see me rocking out on my headphones, I’m listening to Mariah Carey, so there’s also that. The reason I’m saying all this is to justify that one of the reasons I play guitar is Justin Bieber, but we’ll get to that later. Now I’d like for us to get in our mental time machines all the way back to February of 2011. A crazy time where most people had iPhones, everyone rocked skinny jeans, and Barack Obama was president. It was also when I was lucky enough to get tickets to see American Idiot on Broadway. I was excited to hear some of my favorite songs, but louder, and with dancing, and in no way could have anticipated what would come next. This is in no way a reflection of the performance, but for some reason my focus kept drifting to the guitarist on stage right. The show was INCREDIBLE, however I couldn’t take my eyes off him. Fast forward to a couple weeks later and like most people in their late twenties, I went with Stacilyn and Alyssa to see the Justin Bieber movie. I’m not even going to pretend that I went to see it ironically. I’ll spare you my thoughts on the movie as they warrant a full post where every other word is “oh my gosh.” I walked away really impressed by the fact that Justin had been playing instruments from the time he was an itty bitty baby Bieber. Then something important happened. You all might not know this, but Stacilyn is a badass guitar player. I’m her roommate and I didn’t even know until that day in March. When we got home from the movie, she got out her guitar and figured out how to play “Baby” relatively quickly. The only thing I had to offer was my voice, so I sang along while she played. For whatever reason, it was the most fun I had had in a really long time. The singing/playing continued for the next couple nights and one night she tried to teach me some chords. However, being the consummate over-achiever, I was too embarrassed to try and play anything in front of her, and I still needed one final push. That push came from the Foo Fighters. Right around this time they were getting ready to release Wasting Light and were EVERYWHERE. A good portion of my day was spent keeping up with all the press and videos popping up. Dave Grohl has time and time again described the band as being all about guitars. In addition to Dave there’s Pat Smear and Chris Shifflet which means that at any given time they have THREE guitars rocking your face off. That combined with the fact that I’m a lady who would swoon over Charlie Sheen if he played an instrument, is what sealed the deal for me. From that point forward I youtube’d and google’d every video I could of Dave and Billie Joe and even Bieber playing acoustically. I was also lucky enough to work in a place where music happened every day. There were guitars lying around everywhere, and people like my pals Owen and Kirk and Adrien and Roman were nice enough to take time out of their day to show me a thing or two and answer all of my questions. Which was HUGE, since I had a lot of them. 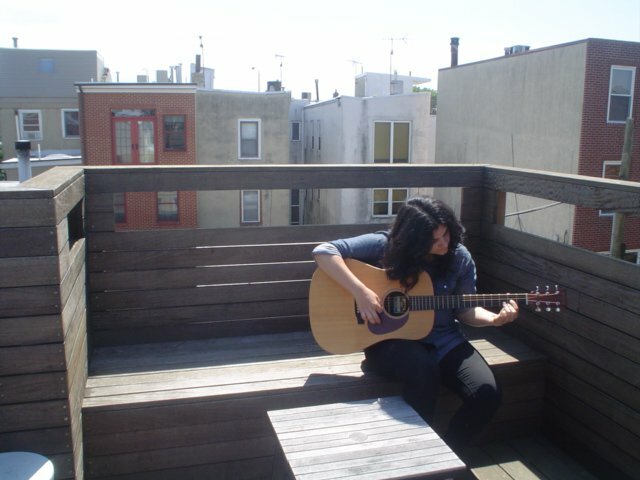 Then, I bought a guitar of my own and haven’t put it down since. The last year has been a transition to say the least. We already covered the weight loss, but a lot of my closest friends moved to LA, I left my job, and cut off all my hair. The addition of guitar into my life helped me manage all that change. I have this thing I do that is purely for fun. It’s mine, and I don’t have to report to anyone about it. Also, I get to like rock out and play music which is kind of super awesome. And did I mention my guit-arms? Pushups got nothing on playing. I digress. So in the end, I want to thank Green Day, Bieber, Foo Fighters, Stacilyn, Owen, Kirk, Adrien, and Roman, cause they’re why I play guitar.